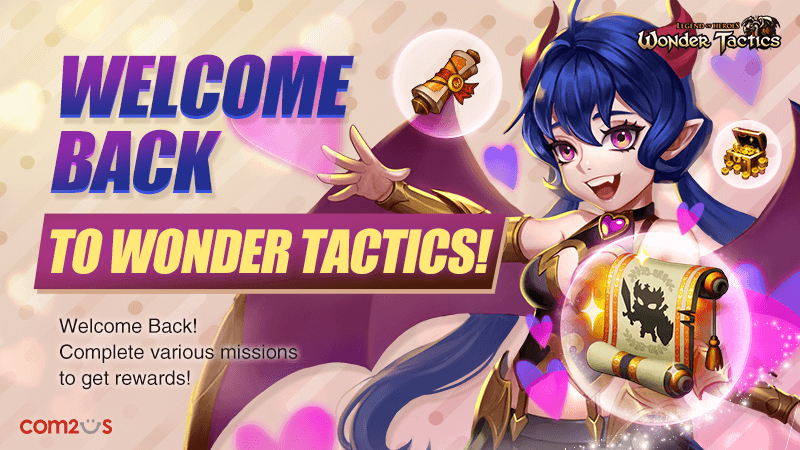 Welcome back to Wonder Tactics! Clear all missions Lunique has prepared and get rewards! - Not sure what to do? Clear missions one by one! 100,000 Gold will be sent per mission you clear and 1,000 Crystals will be sent if you clear all 10 missions! - Try clearing all dungeons! You can get a Legendary Hero Scroll if you clear all 6 dungeons. - Return to Wonder Tactics and make a purchase! 100 Legendary Hero Scroll Pieces and 1,000 Crystals will be sent to those who return to the Wonder Tactics and make a purchase. - Above events are exclusive to the returning users. - All rewards will be sent to the Inbox. - Please try restarting the game if you don't see your reward at the Inbox. - For questions or customer support, please contact our Customer Support by visiting http://www.withhive.com/help/inquire. All times are GMT-8. This page was generated at 11:38 PM.